An MoU was signed between the Department of Computer Science and Engineering, PSG Institute of Technology and Applied Research and Red Hat Academy on 8th October 2018 at PSG Institute of Technology and Applied Research, Neelambur, Coimbatore. Dr. P.V. Mohanram, Principal, PSGiTech welcomed the gathering and Dr.T.Hamsapriya, Head, Department of Computer Science and Engineering introduced the salient features of the MoU. The MoU was signed by Dr. P.V. Mohanram, Principal, PSGiTech and Mr. Mani Varadhan, CEO, Plexus Networks, Bengaluru. Mr. C.V.Mahendiran, Business Head and Mr. Mani Varadhan, CEO, Plexus Networks briefed the details of the offerings by Red Hat and the MoU was exchanged. 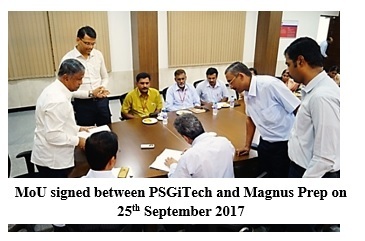 PSG Institute of Technology and Applied Research, and Siemens Limited, India have setup PSGiTech – Siemens Industrial Automation Laboratory with the latest range of Programmable Logic Controllers (PLC). The Laboratory was inaugurated by Mr. Viswanth K, General Manager, Southern Region, Siemens Limited on June 12, 2018. A Memorandum of Understanding to promote collaboration between Siemens Limited and PSG Institute of Technology and Applied Research, in the areas of Industrial Automation, Digitalization of Production and Industry 4.0 was signed during the inauguration of the laboratory. A Memorandum of Understanding (MoU) was signed between the college and Nexmoo Solutions (India) Pvt. Ltd on 17th August, 2017, PSGiTech presided by Shri. L. Gopalakrishnan, Managing Trustee, PSG Institutions. This was followed by the inauguration of PSGiTech - Nexmoo Centre of Excellence (Mobile and IoT) by Mr. S. Pandiarajan, Managing Director, Nexmoo Solutions India Pvt. Ltd. Founded by mobile app experts, Nexmoo creates unparalleled mobility solutions that empower their customers in realizing their vision. Kicking off with Symbian based mobile apps, their mobility solutions expertise has grown up to match the needs of all the major smart phones and tablets today and they are one of the leading mobile app development company in Chennai, India. Exhibiting their technical prowess in Windows, Android and iOS, their team of experts have transformed the mobile app development into a business realistic solution which is to be called enterprise mobility. MoU with NI Systems Pvt Ltd.
A Memorandum of Understanding (MoU) was signed between the Institution and NI Systems India Pvt Ltd on 14th October, 2016, one of the globally recognized companies which has made significant contribution in the production of automated test equipment and virtual instrumentation software. 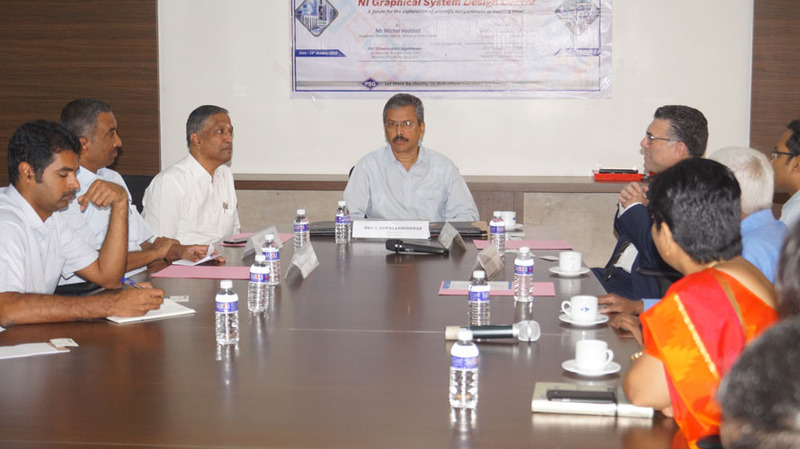 This MoU is signed between PSG Institute of Technology and Applied Research represented by Shri L Gopalakrishnan, The Managing Trustee of PSG Institutions, in the presence of Dr. P V Mohanram, The Principal, PSG iTech and Dr.G.Chandramohan, Vice Principal, PSG iTech and NI Systems (India) Pvt. Ltd. (“NI”), represented by Mr. Solaikutty Dhanabal, Academic Manager in the presence of Mr.Michel Haddad, Academic Director EMEIA, National Instruments and Shri Visweswaran Jagadeesan, Senior Academic Technical Consultant, National Instruments, Bangalore. 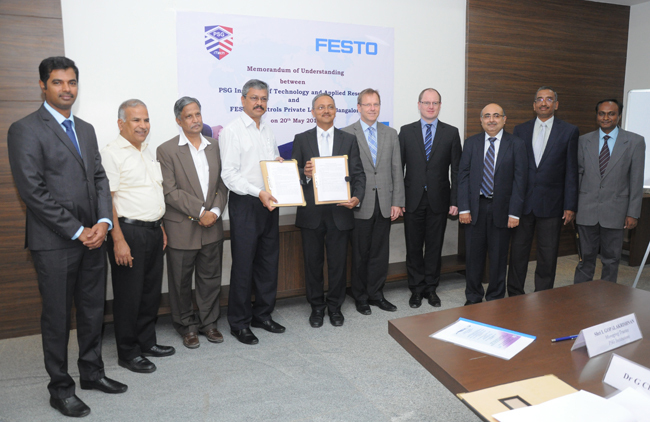 MoU with Festo India Pvt Ltd.
PSGiTech, has signed memorandum of understanding with Festo India Pvt Ltd, Bangaluru for starting Festo Industrial Automation Centre in its new campus on 20th May 2015. Centre of Excellence will offer its students a direct access to Festo’s industrial knowledge and technologies. These learning systems place students in real life situations and enable them to quickly gain practical experience of high tech components used in factory and process automation. The systems cover all relevant fields of automation and manufacturing – from mechatronics, electrical engineering and logistics to production process optimization. These intuitive learning systems are complimented by solutions that train problem solving skills, communication and quality management. PSGiTech has spent more than 35 lakhs for creation of the facility. For the benefit of student community 11 lakhs worth of equipment was provided free of cost by Festo Controls Pvt Ltd.